There are times when bass seem to prefer certain colored flies. 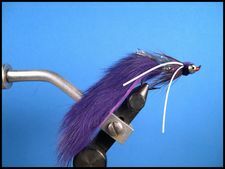 Often times they will key in on purple flies to the exclusion of all other colors. To tie the Purple Dredger use the materials listed above and follow the step-by-step tying instructions for the Black Dredger.